Plain old chairs are one option for outdoor seating, but they aren’t usually the most comfortable or fun way to enjoy your backyard or front yard. Flower decoration hammock chairs from Garden Fun offer a new and creative way to enjoy the natural beauty on your property. These simple and sophisticated flower hammock chairs are built for one person, so you can order as many as you like without having to worry about excess seating that you don’t need. Plus, these flower garden hammock chairs are approved for outdoor use, so the ropes and fabric won’t fade and are resistant to mildew. Not sure whether these flower hammock chairs are right for your yard? Almost anyone can find a great place for one of these cozy chairs on their property. One of the most popular places to hang these chairs is on a front porch or patio. As long as you have an overhang for this area, you can easily use hanging hardware to hang a flower decoration hammock chair there. You can also use a tree on your property as a place to set up your flower garden hammock chair. Whatever you decide, these chairs offer a comfortable and relaxing way to enjoy your very own yard. Unlike regular hammocks, these flower hammock chair swings feature a wooden spreader bar made of Chilean pine. This sturdy bar helps the flower decoration hammock chair keep its shape. You won’t struggle to get in or out of this chair since it stays upright and doesn't fold in over you when you sit down. Enjoy the relaxation and comfort of a hammock without any of the hassle with these beautiful flower garden hammock chairs. This popular chair style is available in a wide variety of prints and colors. 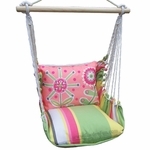 Whether you like bold and bright colors or subtle neutrals, we have the perfect flower hammock chair swing for you.